When Elvis Costello first shook up the scene in the late ’70s with his new wave swagger and his iconic, pigeon-toed punk stagger, few would have tagged him as a musical chameleon. But the bespectacled English superstar (born Declan Patrick MacManus) whose debut album My Aim Is True gave us the classic hits Alison and Watching the Detectives would go on to dabble in just about every genre possible, including pop, country, soul, jazz, blues and classical — all of them sounding authentic and none lacking his songwriting genius. Costello has collaborated with a long list of artists whose diversity matches their collective impact on the music industry: Burt Bacharach, Tony Bennett, Alison Krauss, Lucinda Williams, T-Bone Burnett, the Brodsky Quartet, Willie Nelson, Paul McCartney, Allen Toussaint, Kid Rock, the Beastie Boys, Bill Frisell and even Fall Out Boy and Green Day, to name just a few. But regardless of his musical partners, Costello has always featured a distinctive voice and style. Now, at age 60 and happily married to Canadian jazz singer and pianist Diana Krall, Costello wraps up his long Detour Tour on Wednesday at the Broward Center for the Performing Arts, during which he performs solo, stripping down selections (some as well-known as Oliver’s Army, Accidents Will Happen and Pump It Up, and some not) from his unforgettable 40-year career, and telling the stories behind them. Costello talked to the Miami Herald about going solo, whether there’s a “true Elvis Costello sound,” and the effect Krall has had on his musical goals. Q: What inspired you to do the Detour Tour? A: I’ve been working with different ways of taking the songbook out there, and trying to come up with a different result every night. Honestly, when I had the [Return of the Spectacular] Spinning Songbook show with The Imposters, that left it really open to chance. This isn’t obviously as random as that, but it’s perhaps the opposite — it’s like making a plan for yourself, and then, as the name of the tour suggests, being prepared to break that plan, or depart from that plan. And that’s kind of why I do it. Q: Is playing solo more freeing than performing with a band? A: Well, both things are great. There’s a contrast only in the sense that you have all the pieces of the arrangement in place when you play with a band. With [performing solo], you go back to the way the song sounded when you wrote it — at least, that’s one of the possibilities. I mean, sometimes I’ll play a song quite differently from the way I wrote it — maybe it’ll become faster, maybe it’ll become slower. Sometimes I sit down, not because I’m tired, but because you play the guitar differently when you sit down. Sometimes I’ve taken fast songs, rock ’n’ roll songs, and just sat down and played them and looked at what the story in them was — I had a song called There’s a Story in Your Voice about that mesmerizing sound you hear in somebody’s voice when you desire them. And when you put a rock ’n’ roll beat behind it, it sounds wild, because that’s a thrill that you represent in the music. But when you take it down to just what the words are, there’s also a sad thing going on behind all of that, because sometimes that sound you’re responding to isn’t a true one. There’s a different story being told when you sing it quietly or when you sing it loud — it’s as simple as that. And if I can find that — and I wrote it — then hopefully, people sort of get a surprise. And it also means that you creep up on the songs that people most anticipate, the songs that people think, “Well, he’s definitely gonna sing that one.” I don’t feel like I’m singing them out of obligation — I feel like I’m singing them because I get to them honestly. Q: What can people expect visually? A: I’ve got the stage set up to tempt me down different paths — I’ve got a piano over there to the right, I’ve got a chair to the left, and I stand in the middle. There’s a couple other surprises that I don’t wanna give away until you get into the theater. But there’s an element of presentation, an element of stage-set to this. [But] it’s not water in the tap, that every time you turn it on, you want it to be the same. It’s the opposite of that. Q: Do you go into each night without a set plan? A: I write a set list before the show, but I’m still writing it up until a few minutes before I go on. It’s easier for my crew if I stick to it, but something will happen, and I’ll just suddenly feel I should go a different way. It’ll all just come through in the moment as to what’s the right thing to do. And of course, if I can remember it and if I can perform it, then being on my own allows me to turn corners a lot more readily than if I have to turn to the band and go, “Do you remember how that goes?” They’re really good at doing that, by the way, when I do play with The Imposters — I don’t know another group that would have as many songs in their head as they do. But obviously on my own, I have a lot more. Q: Out of all the genres that you’ve tackled over your career, is there one true Elvis Costello sound? A: They all are. See, I don’t think of it like that — I just think it’s some music that I’m playing, and I’m aware that the musicians that I might be working with might come from another tradition or discipline — classical musicians or bluegrass musicians. But I never really thought I was making a “classical” record: I was just making some sounds and using those instruments to the best of my ability, or I was working with a great acoustic band as opposed to an amplified band — and we were trying to find the thrill of the music with that. So I’ve been very fortunate to have all of those things happen, so I don’t really think of it as a matter of truth, just a matter of good fortune. Q: Has your relationship with Diana influenced your goals as a musician at all? A: I would say that being in life with Diana has influenced everything. But I don’t have any goals as a musician. I mean, I just want to spend more time with her — that’s what I’ve always wanted to do. Of course, that’s not always possible — she’s in Paris right now, and I’m in New York, and it makes our life very thrilling, because we’re always rendezvousing, as they say in France. I kind of make better use of my time than I once did. When you’re starting out, you think everything is possible, and you want to do everything you can. And then you realize that some of the things you thought you wanted to do really weren’t worth your time, and I’m a little bit more jealous of my time now, as in wanting to have time with my family and with my sons and not be away all the time. I just play when I can organize it and the opportunity presents itself. We both work in that way. Of course, I think she’s the greatest, and I wouldn’t say that we influence each other at all. She doesn’t need any influencing — she knows her own mind and what she’s doing at any one time. Good interview. I was intrigued by his comments about There's a story in you voice. Has he stripped it down and played it slow? Great show in Fort Lauderdale. Larking Poe came back out for a second time to cap off the last night of the tour. There were three songs from Goodbye Cruel World and it reminded me how much that album's songs need to be revisited. A album of EC singing those much maligned tunes with Larkin Poe wouldn't be a bad idea. I also liked EC's version of Florida Key - a change from the album version, sounding more like a cousin to "A Voice In the Dark" and "Slow Drag With Josephine." Standing in a blue suit under a white hat that would fit an 1890’s carnival barker, Elvis Costello told the crowd at Broward Center for the Performing Arts, “I thought being in Fort Lauderdale, I would just sing my songs about love and fidelity. 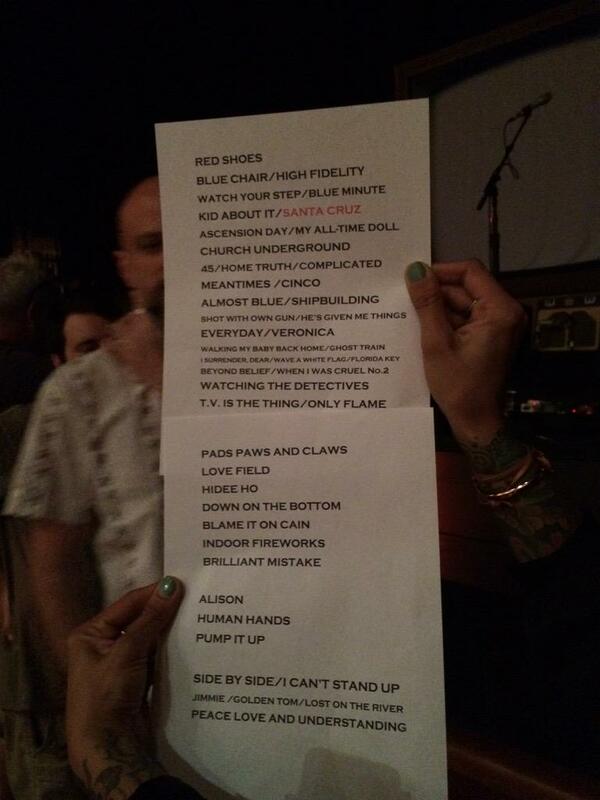 But that would be a short set.” On the final night of his Detour tour, this set was anything but short. Closing in on thirty songs, with three encores, Costello belied his sixty years by performing for over two and a half hours. For a majority of the show, the bespectacled troubadour stood alone strumming his guitar and occasionally tickling the ivories of a piano. With the exception of one coughing fit that forced him to start a song over, his voice sounded terrific projecting to the furthest reaches of the theater. As if to prove the power of his voice, he sang a verse away from the microphone, nervous fans shushed others in the room. But they needn’t have bothered as his words reached the back row. Besides, the crowd was as respectful as any I’d ever sat amongst, between notes was utter silence. Much of the set was acoustic. At one point, he sat down with his steel guitar and let out a solid whistle as he sang “Walking My Baby Back Home” and a cover of Bob Dylan’s “Florida Keys.” Much of the evening had that down-home intimate front porch vibe with Uncle Elvis sharing stories between songs from his past. There was the one about his father singing on the same television program as the Beatles and about the time he fell in lust with a Mexican driver and they fought over what to listen to on the radio before settling on Eddie Money. It was telling how most of his stories had to do with music. At a time in Elvis Costello’s career where he’s already proven himself, he could have done what many of his Rock and Roll Hall of Fame inducted peers do on tour: played his greatest hits for an hour and called it a night. Instead, he tested the limits of how long the Broward Center for Performing Arts would stay open and enraptured fans would stay glued to their seats. As many have said a really good show, disappointing after the show a group of about 20 waited to see Elvis outside of the parking lots gates but it seemed "Elvis left the building" in his tour bus without stopping by. Better Than: Most singer/songwriters going it alone. There’s an old expression that suggests a leopard will never change its spots. I’m not exactly sure how a leopard could change its spots, even if it were so inclined. But the point is, once something is established, it’s destined to stay that way forever. If that’s the case, credit Elvis Costello for opting out of his typecasting as an irascible insurgent forever destined to be known as an oddball rocker whose Buddy Holly glasses and quirky posture played out so well in the post-punk environs of the late ‘70s and early ‘80s. It worked well for quite a while — who can forget his appearance on “Saturday Night Live,” when he abruptly cut short one song in order to launch into a lacerating version of “Radio Radio” instead — but since then, he’s easily transformed himself into an old school balladeer, a classical composer, a country crooner, and most importantly, one of rock’s elder statesmen, the latter category most befitting a gentleman of 60. Costello’s performance last night at the Broward Center’s Au-Rene Theater on the final night of his so-called Detour Tour, found him combining all of those personas, aside from the classical. Though once he wore an ever-present scowl, the Elvis that performed for South Florida was smiling, mugging, joking and offering knowing nods in ways that the old Elvis would never have conceded. Of course, personality counts when you’re doing a solo show sans accompaniment (other than a few intervals during which opening act Larkin Poe returned to join him onstage), and Costello was quick to offer anecdotes about his early adolescence and his father’s own singing career, which was an obvious influence on his own. (A video of his dad performing with a full band back in the ‘60s showed that the son became practically his spitting image.) It was warm, intimate, funny, and informal — all the things one might wish for in an evening by a venerable veteran rocker, but which was rarely once imagined as part of a Costello concert. With the majority of his repertoire reinterpreted for solo guitar, or in some cases, piano, even the better known songs in the generous two-and-a-half-hour set — which included no less than four encores! — took on entirely new personas. It wasn’t so much that the material was stripped down, but rather that it was wholly remade. Consequently, saucy early standards like “(The Angels Wanna Wear My) Red Shoes,” “Watch Your Step,” “Watching the Detectives” and “Pump It Up” were reconstructed, becoming more nuanced and less provocative. Other offerings on the more melodic side — “Everyday I Write the Book,” “The Only Flame in Town” and “Brilliant Mistake” in particular — seemed well suited to the acoustic treatment, although even in those cases, there were some unexpected turns. An obligatory take on “Allison,” for example, segued surprisingly into a tenuous cover of Jim Hendrix’s “Wind Cries Mary.” Likewise, his tinkering with various old time tunes (“Side by Side,” “Hidee Ho,” “Walking My Baby Back Home”) betrayed Costello’s affinity for showbiz schtick, a trait that clearly came from his father. Larkin Poe, comprised of Atlanta-based sisters Rebecca and Megan Lovell, might have seemed an odd pairing for a Costello show at one time. But indeed, they proved well worthy of their opening status, as well as the later interludes with their headliner. Performing on mandolin, guitar and dobro, they played a variety of folk-like numbers with a modern youthful sensibility. Sharing several songs from their impressive debut LP, the Lovell sisters offered both rock and reflection, pairing an edgy attitude with an obvious sibling connection. Their style is clearly special, and kudos to Mr. Costello for giving them the spotlight they deserve. Personal Bias: Always loved Elvis, but he always seemed so intimidating. Not tonight, however. The Crowd: Wholly appreciative, even as they shouted out requests. To which Costello replied at one point, “If you’re lucky.” Another example of Elvis as a funny man. By the Way: Didn’t expect a solo Costello, but the format proved both fruitful and entertaining. The fact that it was the final night of the tour offered plenty of reason for him to let loose. An account I've received of this show says Elvis tagged a song on to the end of PLU , a chorus of Van Morrison's Street Choir , including the line 'Why did you leave America' - can this be confirmed? Anyone got a recording of the show, always like to get the audio of shows I attend.